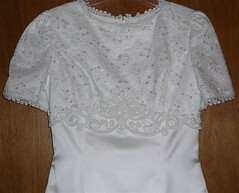 Here’s one more picture…a close up to show detail on the top part of the Wedding Dress. Here’s a picture of the wedding veil too. Here’s another picture of the full view of the Wedding Dress here. Here’s a picture of the Wedding Dress I’ve discussed in the past on here that I wore to my first wedding and I’m not going to wear again. Here’s some pictures I took to use to see about selling it on e-bay now, my size 8 Wedding Dress, what do ya think? Here’s another view of the ponytail lol. Okay so here it is…me with a ponytail…real exciting huh lol.